(UDATE: Scroll down to watch video). The future founder of Superior Tradelines, LLC served in Baghdad, Iraq only on the belief that his finances were taken care of before he left. The future founder of Superior Tradelines, LLC returns home to multiple collection accounts, which include unpaid parking tickets for violations that "occurred" while he was out of the Country. In discovering the imperfections of the credit reporting system, solutions were sought and achieved. 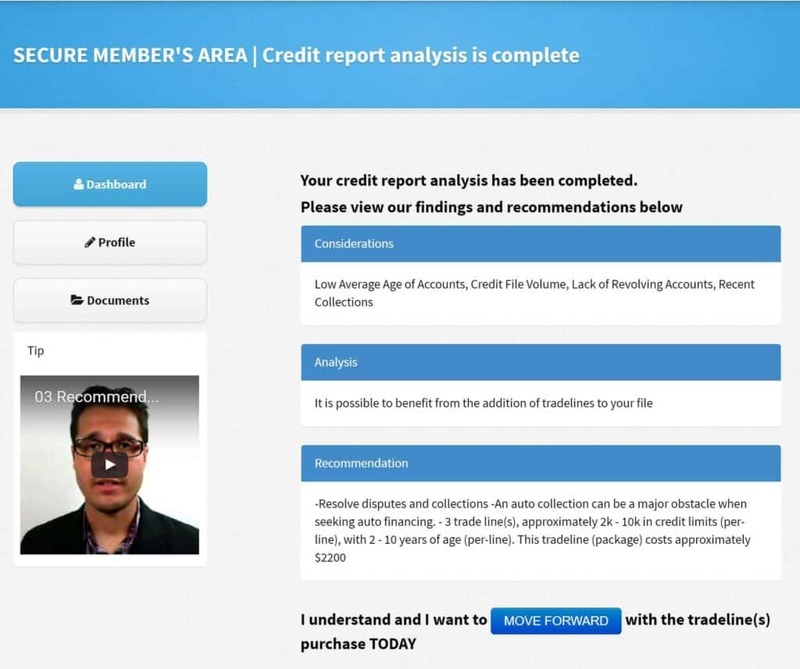 The future founder worked with financial professionals exploring and perfecting various credit repair techniques, such as authorized user tradelines. Superior Tradelines, LLC was born and legally formed. The company entered the market aggressively to bring solutions to those in need. Superior Tradelines, LLC expands to include sales staff, marketing professionals, etc. The company builds relationships with affiliated service providers. Superior Tradelines, LLC doubled its growth every year from 2012 to 2016. We know what to do, and do it. We’ve run across every type of company out there. We’ve seen everything from “that guy who wants to do this new and cool tradeline thing” to “I have 20 years of experience in 2000 different areas”. Here at Superior Tradelines, all we do is tradelines, every day. We don’t spread our selves thin with other tasks or adventures. We have over 30 years of experience on staff… that’s 30 years of experience, specific to tradelines. Your funds are protected with us. Our ethical, state and federal laws are on our side. When you give your money to a tradeline company, 99% of the time, there is no guarantee that you will ever see your money again. That’s not the case with us. When you order a tradeline from Superior Tradelines, your money is placed in a trust account. In addition, your money is protected by a $10,000.00 surety bond. We take security seriously. We have invested in Superior Tradelines for your benefit. We have made secure member areas in which you can upload credit reports, place orders and view the status of your order in real time, among other things. Your member area is secured with Secure Socket Layered encryption on a partitioned sub-domain… that’s tech talk for… “it’s secure”. Once you sign up as a client, you are given credentials for your individualized member area. You’re more than a transaction. It is important to recognize the complexity of piggybacking credit tradelines. You could easily ask “Mom” or “Dad” to place you on one of their cards, but you may not get your desired result. In fact, it is possible to hurt your credit if the tradeline isn’t selected correctly. Let us help you decide, even if you do not purchase a tradeline from us! We’re connected and for good reason. Due to our reliability and dedication to our clients, we’ve developed a large network of credit related affiliate relationships. These relationships range from credit repair companies to attorneys and real estate agents, among others. We are solely tradeline providers and don’t spread ourselves thin with anything else, however, if you present us with an issue outside our specialty, we have skilled, ethical partners that will help you resolve it. While we are tradeline experts, with over 14 years of combined experience, we have witnessed this industry change on a monthly basis from the time we started nearly 4 years ago. The fly-by-nights, the incompetent and the scammers simply can’t keep up. This is a good thing for good consumers like you and a good thing for a business like us. Allow our knowledge and experience get to work for you. We match our solutions with your goals. Once we receive your credit report, our financial experts will analyze your report and recommend services to achieve your credit goals. This step does not take long and is completed when a list of available services is presented and you have made a selection. You could search for 10 different companies that sell tradelines and find 10 different prices for the same line. Usually, however, they are all within the same range; plus or minus $100.00. That’s where Superior Tradelines leads the pack. We evaluate your goals, analyze your credit report, make recommendations, assist with credit repair related needs… all free of charge. The only thing you pay for, with us, is the tradeline transaction. You get a detailed contract outlining our services. Despite the fact that it is illegal to conduct any type of credit repair (including adding tradelines), without first providing an agreement for the services, many companies do. Not here! We provide you with an agreement which sets forth the services we agree and promise to perform. Do not buy tradelines without a signed agreement by the provider. How a bond protects you! In addition to the bond below, you’ll notice that you don’t actually make payments to Superior Tradelines, LLC, but a trust account pursuant to the statute cited above. It starts with you; contact us! You have to contact us before we can help you. No matter how efficient and effective we are, we cannot help you unless you contact us. Before you continue this tour of our service, you might as well reach out to us right now. First, we analyze your credit report. If you don’t know your current position, you’ll never reach your destination, right? Whether you’re applying for a mortgage, auto loan, business loan, etc., we must know the strengths and weaknesses of your current credit posture (that is… we need to know what’s in your credit report). We provide a complimentary credit report analysis (yes… free of charge) so help you better understand our services and whether or not our services are a viable option for you. Sometimes, our services are not appropriate for certain individuals and we recommend alternative courses of action, such as credit repair. In doing so, we lose you as a client… so, you should highly consider this, because we’re telling you the truth when this happens. In other words, if we deny you service and someone else sells your tradelines, you should second guess the second service provider. Because it’s the first step, you’ll receive an email from us explaining how to get your report, if you don’t already have one. Here’s an example of the email, which is a good resource for finding credit reports for free. Assuming you’re in a position to benefit from tradelines, we will move on to tradeline recommendations. Second, we make a recommendation. We will tell you our honest opinion and make a recommendation. At the end of the day, if you’re not happy, we’re going to hear about it, right? So, our goal and your goal are aligned. When we make a recommendation, we’re not trying to close a sale, we’re trying to help you achieve your goals. In fact, our recommendation may not be good news, at all. It is unlikely that you will benefit from the addition of tradelines to your file. Finally, we proactively monitor your success. Your purchase is the start of our relationship, not the end. While some companies end their relationship with you at the cash register, we stick with our clients to the end of our services. We have automation tracking for the tradeline reporting dates and we proactively follow up with you to make sure you are on track. Even if we recommended credit repair – or some other service – we may follow up with you just to see how you’re doing. Results oriented is our process; your success is our success. It was refreshing to work with Superior. They’re super knowledgeable and guided me in the right direction, credit wise. Very straight forward and helpful. Thanks! My name is Frank Williams. I own a credit repair company. Superior Tradelines is one of the best, i mean absolute best companies I have ever worked with in the past 20 years. Their professionalism, integrity and commitment to excellence is truly refreshing. I feel fortunate to work with them. An example of Superior Tradelines integrity is how they turn away potential clients that need credit repair and are not ready for tradelines. Most other companies would take their money and do little or nothing. I’ve researched all the “tradeline” companies out there, Superior Tradelines was the only company that I could find that was licensed and bonded and had great reviews. In today’s internet world where anyone can take your money and run and there’s very little you can do about it. I took the plunge, Raj went over my credit reports and told me what kind of tradelines I needed to reach my goals (qualify for a VA mortgage). I purchased the two tradelines he recommended and my scores went up to where I needed them just like he said they would on all three bureaus (590 to over 640 enough for the VA). I was completely convinced. I called Raj back and asked what would it take to increase my score even higher so I could refinance the new Toyota truck I bought 6 months earlier (dealer 21.9% “Ally financial”) was $556.00 for 72 months. Raj again went over my credit reports, he made the recommendations for the scores I needed. With my new scores I went to the credit union I had joined a few months earlier. Now 3.2% @ $576.00 for 48 months. My only regret, that I didn’t get all the tradelines in beginning. Raj I can’t thank you enough. The cost of buying the (my) new trade lines paid for it self, I got my VA mortgage, and I’m paying off my truck 3 yrs. sooner. The new look is amazing. So much easier to go through. When you have a company that can potentially take thousands of dollars from you and walk away; but instead choose to be honest, ethical, and upfront…they are legit!! Tom took the time to discuss me and my mothers credit report and advised we should take care of a few things on our reports prior to adding the tradelines. I wouldn’t do business with any other company that offers tradelines! This company is awesome! Can’t wait to get started! Thanks again Tom! After a bad experience elsewhere, Superior restored my faith in this industry. In fact, I won’t recommend any else. Fast, reliable and effective; definitely exceeded my expectations from a customer service perspective and certain from a results perspective. I could have ended my testimonial there. The only thing left: Thank you, Superior! Tom Medlin was an excellent person to work. He really assisted me and walked me through the process of becoming an affiliate. I appreciate working with prople who know what they are doing and do a superior job. I would highly recommend him for a managers position. I knew right off the bat that this was a serious company. They lived up to my initial expectation and exceeded it. They have a really smooth process and the staff treated me right. I have recommended Superior to friends, family and clients. I highly recommend superior trade lines to any one that wants to improve there score, credit or all of the above. I use this company and got perfect results, i also want to thank Tom for his excellent customer service..
Superiortradelines is great. They added three tradelines to my credit. It took less than a month. Great customer service! I was very skeptical at first because I have heard horror stories about these type of services… After doing my homework I came to the conclusion Superior Tradelines was my best option… and I wasn’t disappointed! My customer service representative Raj Sahoo was very informative and assisted me in every aspect… from advising me what line was best for my particular need to always being available to answer any questions or concerns. The bottom line and final result exceeded my exportation’s! Thank you Raj and Superior Tradelines. Exceeded my expectations.They delivered what they promised in the time frame they promised. Friendly staff, answered my questions promptly. I am very satisfied with the service and would recommend them to friends and family. Hey Kate, I wanted to let you know I close on my house Monday. wooooo hooooo! thanks for all your help! Superior Tradelines was no nonsense from start to finish. I thought they were just really good sales people, but throughout out the process, I learned that they simply tell the truth and help their clients. My advice is listen to them. Call them, now… you won’t be disappointed. My name is Tomaine Davis and I bear witness to the authenticity of superior trade lines. I have known of superior tradelines for quite some time. Working with Raj Sahoo have really helped me financially and I have been educated about maintaining and building my personal credit. I recommend anyone who is willing to take advantage of working with superior tradeline to better your financial situation. This testimony can be used by superior tradelines with my full name as well. Thanks for everything Raj Sahoo. I bought 3 tradelines and increased my credit score 117 points in one month, I got approved for $60,000 thanks Raj. Recently I hired a credit repair service that cleaned up my credit report and left me with a nice clean file and I wasn’t sure how to proceed with building my score and credit standing. I had no idea what tradlines were and how I could use them to quickly improve my score and credit standing. While researching how to use tradelines, I stumbled across Superior Tradlines and with the purchase of just one tradeline, I now have a handful of credit cards that I am strategically using to strengthen my credit score and history. I can now rent cars, properties and am getting closer to being able to purchase some real estate of my own. All things that weren’t possible for me just a couple of months ago. I am also feeling much more confident to acquire funding if needed as I am growing my existing business. I have primarily worked with Mike at Superior Tradelines and he along with the couple of others that I have spoken with, have all been very professional, informative and really great to work with. I’m so happy that I went with superior trade lines it was a life changing for me with out it I would not be able to get 90 K in Credit and best part low interest rates my credit was 650 once trade lines from Superior Trade Lines posted my Credit score went to 790 in all three Equifax Transunion and Experian .Thank you so much ????? Great source. Fast and appeared on date stated. For the first time in my life, not only is my questions answered but also problem was solved and the great people at superior tradeline, especially Raj was so professional and did everything in his power to ensure I achieved the result needed to start my new business. I don’t want to go into too much details. Thanks you so much Raj for your professionalism and helping me to attain my goal. I look forward to recommending my friends to you in the near future. I tried 2 other companies prior to finding you guys and the difference is day and night. Thanks again Raj, more blessings. I must say my credit scores were in the low 600’s before I contacted Superior Trade Lines. I was a skeptic and so was my accountant. But Raj assured me all was good and was patient in letting me see that all was above board and would work. Today I can say I was approved for several credit cards with limits above 5000.00. My scores jumped to high 600 to high 700’s in less than thirty days. I’m impressed and will spread the word.Thanks Raj for all your help. I had my doubts as most. However when that tradeline hit when it was supposed I was still a little doubtful. However after a score increase to the 700’s and I applied and received several credit cards and 2 personal loans. I am hooked. I recommend this to anyone who wants a jump start or boost in life. The customer service of superior tradlines is among the best. Tom, your great man thanks for everything. Since we’ve been using Superior Tradelines as our preferred Authorized Tradeline company, our clients have been able to establish credit faster and securely through their amazing database of active reporting tradelines. Their customer service is impeccable and professional. Our clients first have their credit repaired by us by removing their negative/erroneous items and then we upgrade them using Superior Tradelines benefiting them to higher credit scores. We recommend Superior Tradelines. The proof is in the credit scores! After much confusion I selected Superior Tradelines to assist me with boosting my credit score. HOW WAS MY EXPERIENCE AWESOME! AWESOME! Awesome! From start to finish Tom was beside me guiding me each step. At the end credit that started at 522 became 780. I t was like being given a new lease on life. I immediately was preapproved for a home, I was accepted or each credit card I’d applied. I ended up deciding not to purchase a home at this time but decide to lease a car needless to say I was approved with nothing down and their best rates. I also was approved for my dream condo (rental). It’s a Chesapeake Bay front condo, prime location. This have changed my life, changed my life. Thanks so much Superior Tradelines, and TOM you’re my super hero, could not have done it without you. Raj and the team at Superior Tradelines are the best in the US at what they do and definitely go the extra mile for customer satisfaction! Raj picks his phone up even after business hours to make sure you have no concerns or worries. I would recommend anyone to this company for sure! If your looking for top quality service stop here and place your order now you can’t go wrong! Thanks agin Raj and the whole superior family!